Miami hasn’t won a postseason game in Gainesville since 2002. The Big “E”s: Miami committed seven, that’s right seven errors in Saturday’s loss to Florida. Only one of the four runs scored by the Gators was earned. In fact, just two of Florida’s 11 runs in the two games was earned thanks to nine Hurricane miscues. Miami hasn’t won a postseason game in Gainesville since 2002. Mighty Mo: It didn’t take long for Texas to take back the momentum in it’s series with TCU. After losing 3-1 in Friday’s opener the Longhorns drubbed the Horned Frogs 14-1 on Saturday to send the game to a deciding third game. The rout was due in part to the dominant pitching of Taylor Jungmann, who struck out 9 in 8 1/3 IP, but also largely to three Horned Frog errors that led to six unearned runs scored by the Longhorns. All five runs allowed in 3 2/3 IP by TCU starter Steven Maxwell (11-2) were unearned. Crowded House: The first two games of the Texas-TCU Super Regional have drawn more than 7,300 fans each to Disch-Falk Field. That makes 21 games this season in which the Longhorns have played in front of a crowd of more than 7,000. Livin’ On The Edge: Vanderbilt downed Florida State 6-2 Saturday to force Sunday’s winner take all game. The win makes the Commodores 4-0 in NCAA elimination games this year. Saturday’s win halted Florida State’s seven game winning streak. Not So Super: This is Florida State’s 10th Super Regional since 1999, but the Seminoles have won just one of their last seven Super Regional series since advancing to Omaha in the first two years of the format in 1999 and 2000. Three of those Super Regional losses came on their home field. Including their 1-1 mark this year, the Seminoles are 9-14 all-time in Super Regional games. Great Garvin: Commodore reliever Grayson Garvin tossed three shutout innings to finish Saturday’s win. Garvin has now given-up just two runs with 12 strikeouts in 13 1/3 innings in three postseason appearances this year. Yastrzemski, but he has a Seminole connection as well. Mike’s dad, Michael, played at Florida State from 1980-’83. Mike is 4-for-7 in the Super Regional with a double, a home run and two RBIs. Is That A Girl, What’s She Know About College Baseball? Those were my wife’s words, not mine, when she heard Pam Ward doing the play-by-play of Virginia’s 3-2 win over Oklahoma in game one of their series. I’ll admit I was skeptical of Ward doing the game, and I’m sure I wasn’t alone. I have to say though that Ward did a solid job. She’s got a lot of experience doing softball games, and she even used that to provide some baseball insight. Ward talked about the current moratorium on composite bats in college baseball and how college softball may consider the same thing with all of the home runs hit at this year’s Women’s College World Series. Hoos Boom: Virginia scored all three of its runs in that game on home runs. Phil Gosselin led-off the bottom of the 1st inning with his 10th HR of the year and then Dan Grovatt hit the deciding two-run blast in the 6th. Nice Lid: Did you see the hat UCLA pitcher Trevor Bauer wore during the Fullerton game at Jackie Robinson Stadium? It’s so faded and worn looking that it looks like Jackie Robinson could have worn it during his playing days with the Bruins. That’s A Bold Statement: “Of all the guys I’ve seen hit Harold Martinez is my favorite hitter. Manny Ramirez is my guy in Major League baseball. When I walk into a room and a Manny Ramirez at-bat is on I’m not walking out. That’s how I felt about Harold Martinez.” That’s what Eric Byrnes said about injured Miami third baseman Harold Martinez, who was hospitalized in Gainesville with an infected shin. Byrnes got to see first hand last week just how explosive Martinez’s bat is when the sophomore had 9 RBIs and two HR in the Coral Cables Regional. Jake Smith hit a home run and earned a save in Alabama's win. Tide Rolling: Alabama beat Clemson 5-4 in Saturday’s series opener. The Crimson Tide, which barely made the SEC Tournament field, has won 13 of its last 15 games to move to within one win from Omaha. 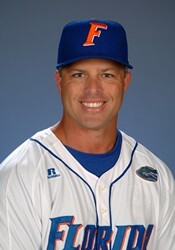 One more win would make Mitch Gaspard just the second rookie coach in the last 30 years to take a team to the College World Series. Dan McDonnell did it at Louisville in 2007. The Two Jakes: How about Alabama’s Jake Smith? The senior started at third base and hit his 14th home run of the season to help the Tide win Saturday’s game. He then gave-up just a hit over the final two scoreless innings of the game to earn his sixth save. It’s On Where? With all eight Super Regionals in action on Saturday it was a little hard to actually find where some of them were (or weren’t) being televised. I was never actually able to watch the Alabama-Clemson game on TV. I did watch parts of it on ESPN3.com. That’s where I found most of the UCLA-Fullerton game, and then the video froze. Turned out they moved it to ESPN2 after the Florida-Miami game was over. It’s just a shame that unless you were on the west coast most of the UCLA-Fullerton series was either on TV after 11pm ET Friday night (it ended after 2am) or was not on TV at all. Bopping Bruins: UCLA hit four home runs in Saturday’s 11-7 10-inning win over the Titans. Tyler Rahmatulla had the biggest of the blasts. With UCLA down to its last two strikes of the season the sophomore’s 2-run shot gave the Bruins a 7-6 lead in the top of the 9th. Fullerton tied the score 7-7 in the bottom of the inning, and then UCLA plated four in the 10th for the win. Golden Gallego: Bruin shortstop Niko Gallego made two great plays in the bottom of the 10th to help force Sunday’s deciding game. Niko is the son of 13-year MLB vetern Mike Gallego. White Between The Eyes: When Arizona State reliever Mitchell Lambson went to the mound in the top of the 8th inning umpires apparently told him he had too much rosin on his hat. The reasoning would be that the white from the rosin could be deceptive to Arkansas batters. Sounds fairly reasonable, and the rationale would be in line with the fact that pitchers cannot have white on their gloves. What I’ve never understood is how a few white stitches on a pitcher’s glove (or in this case rosin on a hat that’s also covered in white salt stains) aids in hiding the ball than a full home white uniform (like ASU was wearing Saturday night)…or even white lettering on a dark uniform (like Arkansas had). Lights Out Lambson: Rosin or no rosin, Lambson had 2 Ks in a 1-2-3 inning, and he wasn’t done there. In a game ASU eventually won 7-6 in 12 innings, Lambson (8-2) fired five shutout innings of relief with six strikeouts to earn the win. Uggghh: I really want to watch the Arkansas-Arizona State series, just not with Justin “I continually second guess head coaches who have been to the College World Series four times” Kutcher calling the action. Ok, so Dave Van Horn didn’t bring in Brett Eibner to pitch leading 6-5 in the 9th inning…we get it. Now go back to criticizing umpires. Tough Night: Eibner was called out not once, but twice for batter’s interference. The second one ended the top of the 12th inning. The two-way star (21 HR, 69 RBIs) then gave-up the game-winning hit to Deven Marrero in the bottom of the 12th.